ARTISTIC STATEMENT: Growing up, I always enjoyed drawing but I began my adventure into art as a mature student when I was introduced to Calligraphy. I was inspired by the dedication and precision that the subject demanded. Later, I began a Botanical Illustration course and realised that the subject required the same steady hand precision and an eye for detail. BIO: While I have been gathering my qualifications and knowledge, I have learned a wide variety of techniques, including calligraphy, fabric painting, graphic design and art in education and botanical illustration. 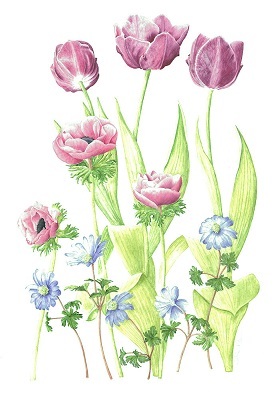 Currently, I am working on botanical commissions, calligraphy for a church project and certificates for a Golf Club. I also write the entries into a Baby’s Remembrance Book at The Ipswich Hospital and for the Suffolk Constabulary, Ipswich. EXHIBITIONS: I have participated in I.B.A. exhibitions and to my delight received the Botanical Excellence Award during 2016. I was lucky enough to have two of my course paintings selected for the S.B.A. Exhibition at Westminster Central Hall in London. A page from my sketch book was chosen to be included in the publication of ‘Handbook of Plant Forms for Botanical Artists' by Ernest E. Clark and Margaret Stevens.